Looks like P&G is trying something different with their sampler packs! 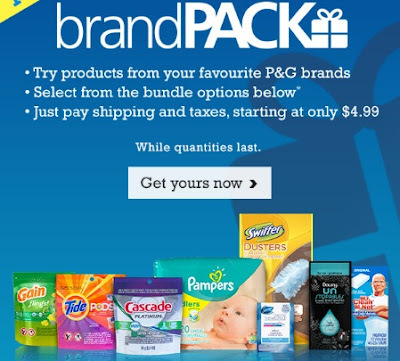 You can now try products from your favourite P&G brands by purchasing bundle options starting at $4.99 (shipping and taxes included). I got an invite for this through Shopper's Voice earlier today. Limit one BrandPack per year, per household. Contents may vary. Trial size products (Excluding Pampers). While quantities last. Click here to sign up for P&G alerts of New Samples and Coupon offers.